This section provides a tutorial example on how to use IE (Internet Explorer) as an XML file browser. IE displays all elements in an XML file in a tree structure. Different colors are used for comments, element tags and contents, and attribute names and values. Elements that have nested child elements are prefixed with "-" or "+". "-" or "+" can be clicked to expand or collapse the sub-elements of a nested element. White spaces and element ending tags are re-organized. 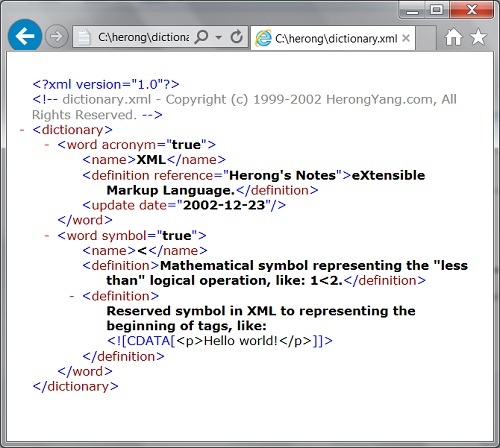 XML entities are substituted by the characters they are representing. Characters in the CDATA section are preserved as they are.